DOCTOR WHO: Classic Doctors, New Monsters, New Possibilities – Part 1 | Warped Factor - Words in the Key of Geek. Tony Fyler pits the old against the new. Big Finish now has a license to pair Classic Doctors with New Who monsters and villains. Since I’m in the middle of thinking up new story ideas for as-yet-unrebooted Classic monsters and villains with the Capaldi Doctor, I figured it might be fun to switch the idea around and – while specifically avoiding the pairings that have been announced, and pairings that match Classic Doctors with villains that are actually Classic but have already been rebooted (*cough, Eighth Doctor and Sontarans, *cough) see what storylines and pairings immediately come to mind for New Who monsters and villains with some Classic Doctors. As ever, this is a game – play along in the comments if you like. The Tardis suffers a critical timing malfunction as it lands on Verakis IV, where to his consternation, there’s a Big Drilling Project going on – Project Limitless. The Verakians aim to tap the molten core of their planet to provide limitless heat and energy for the planet, as a safe alternative to fossil fuels or dirty nuclear power. So far, so Inferno – the Doctor and Leela warn of the folly of the project, but the Director, Professor Sherwin Salus, is a man driven by the spectre of nuclear power – his parents were both killed when a nuclear planet went critical, and he swore as a boy to find his planet an alternative. Project Limitless is a success, he claims, having run tests on initial core samples and found the energy output to be staggeringly high. Then, with no seismological warning, Triska, an adjacent landmass, is engulfed by a tidal wave of molten lava that has shot up from beneath the sea. The death toll is colossal but Salus refuses to acknowledge any connection between Project Limitless and the horrific destruction of Triska. 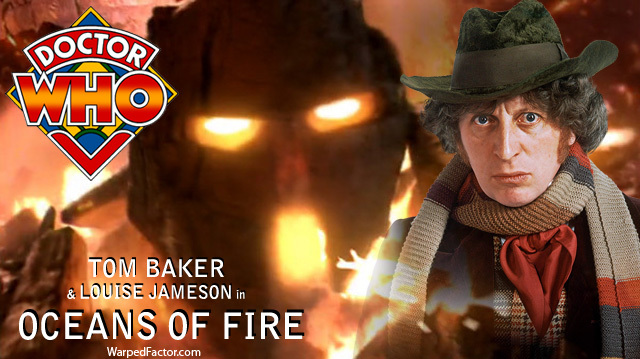 The Doctor tests a sample of the core, and discovers what Salus has not been wanting to see – the lava displays discrete motion patterns that suggest only one thing – it’s alive. Salus won’t listen to the Doctor, but Leela makes friends with his assistant, Professor Leah Methrick, who, with less of a personal investment, is able to see the truth of the Doctor’s research. With an increasing instability in his mind as his friend and assistant ‘turns on him’ but the ‘ghosts’ of his parents compel him onward, Salus takes the law into his own hands and locks Methrick and the Doctor up – Leela, being Leela, evades him. The drilling continues. Then they come. Wave after wave, flank after flank of glowing, steaming fire-people emerging out of the bubbling seas, to spit lava over the land. The Pyroviles have been living peacefully at the core of the planet for millennia, but now they have been disturbed, kidnapped, forced into slavery (the Limitless process) and ultimately bled dry of their life-giving fire. And so, without declaration, the Pyroviles have gone to war. Leela tries to do battle with them, and fails – metal weapons melt before they even make contact. She returns to free the Doctor and Methrick, and the Doctor tries to broker a peace with the Pyroviles, claiming the drilling was done in ignorance. All looks to be going well, until Salus intervenes and tries to kill them – he dies in the process, and the Pyroviles declare the world will be theirs – as below, so above, they will make this world their ocean of fire, their Pyrovillia, and wipe the fleshkind from their surface. With no option, the Doctor and Leela organize a retreat to high ground, and are ultimately forced to use the Tardis to collect as many of the Verakians as they can, and relocate them to a new world. Methrick is key in organizing the evacuation, and will become a leader of the new world, with hard, important lessons to teach her people. 14th April, 1865. Ford’s Theatre, Washington. John Wilkes Booth fires a Philadelphia Derringer pistol at President Abraham Lincoln, and - thanks to the intervention of Jarrold, a rogue Time Agent - misses. 18th December, 1865 – The Fifth Doctor, Tegan and Turlough arrive in Washington to the 13th Amendment (abolishing slavery) ratified. As they arrive, the Tardis undergoes a major change – the lights go out, the dimensions contract and as it lands, the ‘wooden’ outside walls fall apart, spilling the travelers out into the world, with no hope of moving on, ever. In town, they learn that Lincoln is still President and will be present for the ratification himself. They also learn that Ford’s theatre appears to be haunted by the ghost of Booth, who goes through his speech and fires a shot at the Presidential box every night at exactly the same time. Except the ghost is not ghost – it’s actually Booth, trapped forever in the moment that fractured time. What’s more, there’s a killer on the loose – striking randomly, at anyone and everyone, without motive, and without leaving a body. They simply go missing and are never seen again. The Reapers are at work. They shouldn’t be – the Time Lords should be able to take care of a paradox like this, but the Doctor can’t contact them, meaning the Reapers are flying in to sterilize the redundant timeline. Meanwhile, Jarrold is trying to engineer a gateway out of the redundant timeline he’s accidentally become trapped in – further weakening the fabric of space-time of Washington in 1865. The only chance the Doctor has of getting himself and his friends out of this alive is to persuade Abraham Lincoln to go and sit in his box again, and die by the ‘ghost’ assassin’s bullet. What could possibly go wrong? The Doctor wakes to find himself in a small grey cell, dressed in an orange jumpsuit. Attempts to escape prove futile, and eventually, he is marched out for exercise in solitary confinement, but with a single Atraxi guard. He demands to know his crime, the term, the appeals procedure, but is simply told, time and again that he has been tried and found guilty of crimes against the Atraxi, and that execution will follow shortly. Peri wakes up in a small grey cell dressed in an orange jumpsuit. Attempts to escape prove futile, and eventually, she is marched out for exercise with other prisoners and a single Atraxi guard. 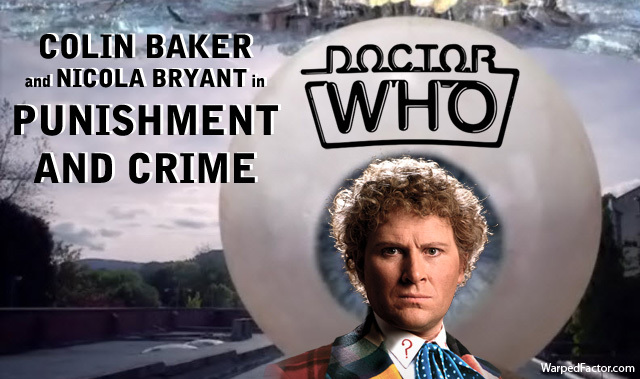 She demands to know what she’d done, where the Doctor is, and how long she’ll be there, but is simply told, time and again that she has been tried and found guilty of crimes against the Atraxi, and that execution will follow shortly. Having made friends with a couple of fellow prisoners, Ros and Kara, both of whom are equally clueless of their crimes, Peri decides to stage a prison break, sparked by a fake fight fanned into a riot. Meanwhile, the Doctor bamboozles his guard with a logic paradox about the nature of rehabilitation and repentance depending on knowledge and understanding of the crime committed. Running almost literally into one another, Peri says they should make for the walls, but the Doctor points something out to her – they still have no idea what it is they’re supposed to have done, and they were snatched out of their lives. Reluctantly agreeing that something must be done, Peri follows the Doctor to the Intendent’s office, where the Doctor threatens the Chief Atraxi with an investigation by the Shadow Proclamation and the truth comes out – the Intendent received a payment to incarcerate the Doctor and his companion from an unnamed enemy; it’s a practice that’s been going on for decades in the for-profit Atraxi prisons of Traxis Minor. 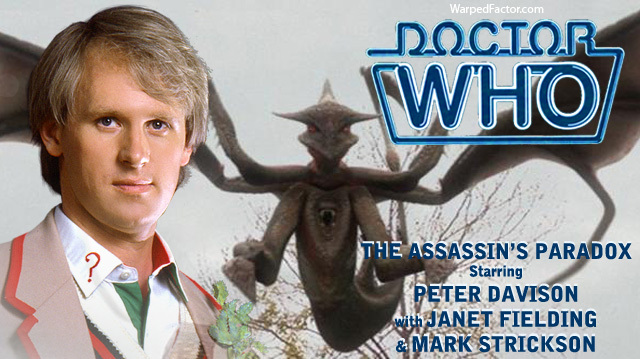 The Doctor and Peri are freed, and they contact the Shadow Proclamation anyway, to get the rest of those unfairly incarcerated by the Atraxi freed. Read Part 2 here, featuring the Second, Seventh and Eighth Doctors coming face to face with New Who monsters. This article was originally published July 13th, 2015. 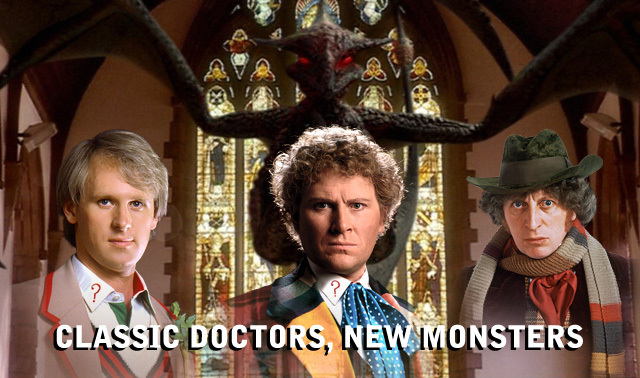 Classic Doctors, New Monsters Vol 1 from Big Finish is released July 2016. Find out more here.